Quality of Service is used in Oracle Service Bus when we want reliable messaging. Oracle provided very good explanation of Quality of Service in below link. We should not use XA or Exactly Once setting for quality of services unless it is really required because this put overhead on CPU and I/O. As mentioned in the link above, we can have three possible vales for Quality of Service. When we use route node, quality of service is always “exactly-once” by default if proxy service is transactional. To add quality of service, you need to go to Communication à Routing Options. 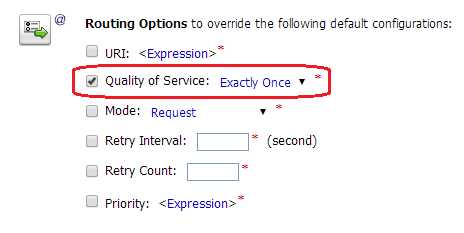 Once you add Routing Options activity, there you can set “Quality of Service”. Next post show use case of Quality of Service and where and how we can use Qos in OSB.